Mitchell has released its first-quarter 2017 Industry Trends Report, and like CCC’s “Crash Course,” shops shouldn’t pass up the chance to score free market data. The first 92 years of automotive innovation, from 1908 through 2000, brought us flashing turn signals, cruise control, airbags, crumple zones and anti-lock brakes. Vehicle technology has advanced exponentially since then. We’ve gone from backup cameras to experimental autonomous cars in less than a decade. Early last year, California Department of Insurance regulations aimed at combating steering and methodologically flawed labor rate surveys took effect. “The CDI approved new regulations in 2016 forcing insurers to pay ‘rack rates’ which are randomly set by body shops and these costs could likely be passed on to consumers and businesses,” the PCI wrote in April 2017. We cast considerable doubt on their claims back in April 2017. 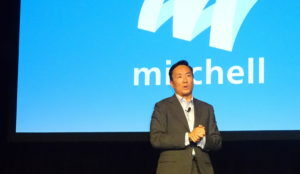 Mitchell’s year-end data for its home state indicates we were right, and their predictions of California shops going bananas with labor rates were unfounded. 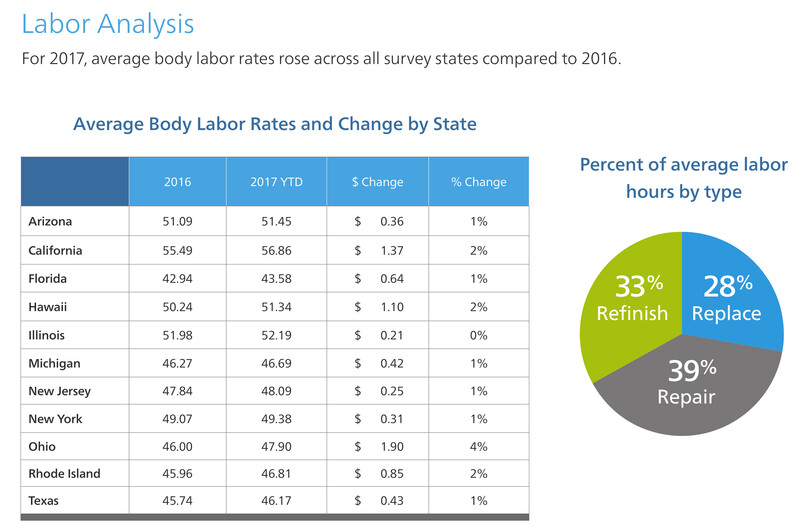 The average California auto body labor rate rose from $55.49 to $56.86 in 2017, according to the first-quarter Mitchell report. That’s a 2.4 percent increase, barely more than the 2.1 percent national inflation rate and less than the California inflation rate of 2.9 percent. That’s an important thing to remember as insurers push for Assembly Bill 2276 — the new version of 2017’s loophole-packed labor rate survey measure Assembly Bill 1679 — in response to the regulations. The bill allows insurers to use laughable methods to generate a labor rate survey and have the state consider it a good-faith effort, thereby undercutting the entire point of the CDI regulations meant to check such behavior. The California Autobody Association has called an emergency meeting over the new bill for 10:30 a.m. to 1 p.m. April 28 at the Los Angeles Trade Tech College. It’s also interesting to watch the rates in Rhode Island, which the Providence Journal in 2015 described as home to a constant stream of insurer-repairer legislative battles. Recently, Frank O’Brien, vice president of state government relations for the PCIAA, told the Senate Judiciary Committee that the state’s premiums ranked among the nation’s highest (to which a shop representative countered that the rates had held that same rank for decades). The bill involves expanding the scope of the state’s OEM parts choice laws and has nothing to do with labor rates — insurers warned instead of automakers hiking parts prices. However, it’s important that lawmakers and repairers understand that the only factor repairers can actually control — labor rates — isn’t running wild. Rhode Island labor rates climbed 1.8 percent in 2017 from $45.96 to $46.81. That was the multistate Northeast inflation rate in 2017 and obviously less than the 2.1 percent national inflation rate. Enterprise reported that the 2017 length of rental was “up slightly” from 2016’s 11.98 days to 12.4 days. 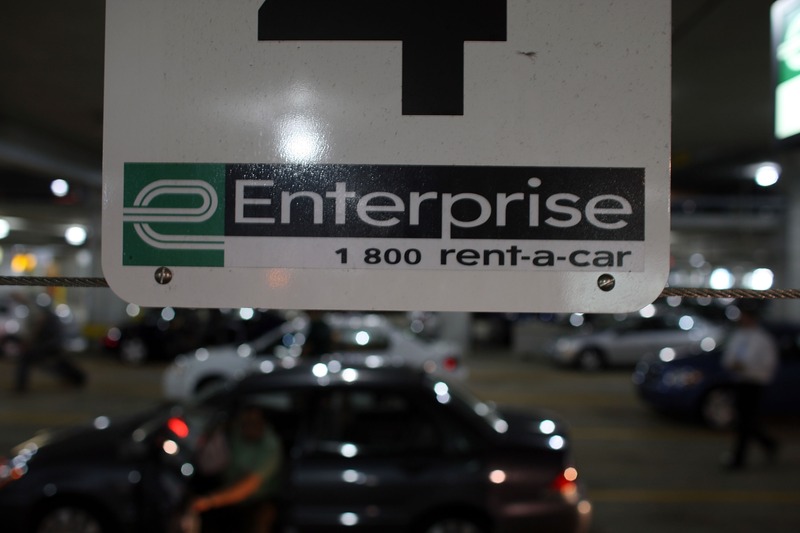 “Once again, there was very little consistency between regions and states, suggesting that the quarterly result for the U.S. is not reflective of a genuine national trend,” Enterprise collision industry relations and sales Assistant Vice President Dan Friedman wrote in the latest quarterly length of rental report. Echoing a 2015 analysis by I-CAR, Friedman reported that shops with more training and other strategies posted lower length of rentals — a sign that quality repairs don’t actually take longer. Mitchell also presents some third-party findings about the possible role of artificial intelligence in auto insurance claims, including a nod to its own repair-vs.replace AI evaluation tool. Sun used the example of how successive generations of an artificial intelligence were able to beat humans at Go — a game he called “infinitely more complex than chess” — to illustrate how a similarly trained AI might bring tremendous efficiency to the industry. Of course, one of the most important concerns about artificial intelligence echoes a problem found in human intelligence: garbage in, garbage out. If the computer received its education by reviewing a data set of largely incorrect estimates — which given the industry’s insurer kowtowing, lack of training and failure to consult repair procedures or conduct research is a very real possibility — then it’s going to make the wrong decisions in the future. That’s no different from a technician or adjuster who had a poor teacher and unintentionally carries out an operation incorrectly — except that an errant AI could have far wider consequences. Fortunately, insurers — and Mitchell — seem conscious of this challenge, based on a 2017 Tata Consultancy Services study Sun cited. “In the Tata study, participants were asked to rank what they thought the biggest risk was to successful AI implementations—an interesting question when posed to an industry built on evaluating risk,” he wrote. No. 1 was “Developing a system that makes good, reliable, and safe decisions,” according to TCS. “To me, this is also the area of greatest potential reward,” Sun wrote. For the record, TCS reported No. 2 for the insurers was making the system hackproof. No. 3 was a tie between “Developing a system that continually learns, in order to make better decisions” and “Getting managers and employees to trust what our cognitive systems are advising them to do” — both of which touch on the point we raised.